Police have identified the man who took 17 people hostage at a Lindt cafe in Sydney's Martin Place on Monday as 50-year-old Man Haron Monis. An Iranian who received political asylum in Australia in 1996, Monis was known to police and on bail in Sydney facing a number of serious charges at the time of the siege. He was a self-styled Muslim cleric, but had been rejected by both Sunni and Shia members of the Sydney Muslim community, according to Keysar Trad, founder of the Islamic Friendship Association of Australia. "This man is damaged goods. He came across as someone with a serious mental illness," Mr Trad told ABC TV on Tuesday. Kuranda Seyit, the director of the Forum on Australian Islamic Relations, told BBC Five Live Breakfast Monis appeared to be "a bit of a loner" who was "isolated from the [Muslim] community". 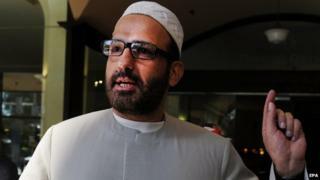 Monis' former lawyer, Manny Conditsis, told the BBC Monis had become "unhinged", but was not a jihadist. Monis was "blinded" by what he saw as his cause, to lobby governments against sending soldiers to wars he considered unjust, Mr Conditsis said. In 2009, Monis was convicted of sending offensive letters to the families of deceased Australian soldiers who died while serving in Afghanistan. In some of his letters, he called the soldiers "killers" and "murderers". In December 2013 Monis was charged with being an accessory to the murder of his ex-wife, and given bail. Monis's ex-wife was allegedly stabbed 18 times and set alight in an apartment stairwell in April 2013. Monis was also facing more than 40 sexual and indecent assault charges. These relate to time allegedly spent as a self-proclaimed "spiritual healer" in western Sydney, according to the Sydney Morning Herald (SMH). Monis denied the charges against him, which he described as politically motivated. He compared the accusations of sexual assault to the case of Julian Assange, founder of the whistle-blowing website Wikileaks. Monis "believed he was being victimised and singled out" for his "lobbying against the government", and had alleged that he was tortured while in custody, Mr Conditsis said. The lawyer added that Monis appeared to have changed over the past year. "Something [had] happened to cause him to become unhinged." Monis may have thought that it was "inevitable he would go to prison" and that he had "nothing to lose", Mr Conditsis added. Mr Trad said members of the Muslim community spoke to Monis about his behaviour, after the offensive letters to the relatives of dead soldiers came to light. "I told him at that time it was wrong and unacceptable," he said, adding that Monis seemed to be sorry for bringing the community into disrepute. Mr Trad said he believed that if someone from the Muslim community had been able to speak to him during the siege they might have been able to talk Monis around. "From what I hear from the police he refused to talk to anyone from the [Muslim] community but if we had known who he was perhaps we could have barged in... we wanted to be part of the solution if we could." SMH journalist Anne Davies met Monis in September, when she reported on a rally held against raids by anti-terror police on a dozen houses in Sydney. Ms Davies said Monis had written to politicians and the police about what he claimed were terrorist activities by non-Muslims going unpunished. "My impression was he was a little unstable," she wrote in SMH. "He also seemed a little creepy. Ominously, he also told me he did not think giving speeches would be enough." 1. At 09:45 on Monday local time (22:45 GMT Sunday) police are called to the Lindt Chocolat Cafe in Sydney following reports of an armed robbery. It soon emerges a gunman is holding a number of people hostage. 2. Between 16:00-17:00, three men, then two women, sprint to safety from the cafe's side door - a fire exit. 3. Just after 02:00 on Tuesday, a loud bang is heard from the cafe and special operations officers advance towards the side door. 4. More hostages escape, running to safety on Elizabeth Street. 5. Moments later, commandos storm the cafe via a number of entrances. The remaining hostages escape. 6. Police officially confirm the end of the siege at 02:45 local time. They later report the deaths of three people, including the gunman.